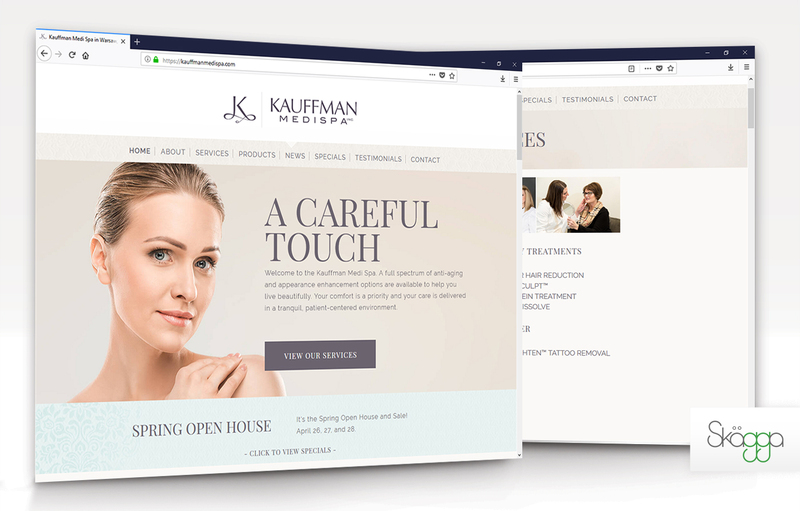 A Fresh Brand Update and Web for Kauffman Medi Spa, Inc.
Warsaw, IN - We have been privileged to work with Jennifer Kauffman on a renewal and re-branding of her medical spa, now Kauffman Medi Spa, Inc. Realizing this design would have to be delicate and precise, our team developed a new mobile-friendly website that seeks to elegantly portray the company motto "live beautifully." We collaborated on the logo design. The monogram was designed with intentional thick and thin lines to emphasize refinement and beauty. Look carefully at the 'K', it is made up of 'J' and the 'K' referencing the owner's initials: Jennifer Kauffman. Special attention was given to the Medical Spa's marketing objective: promoting their services, and more precisely, the before and after galleries that showcase each service. A custom gallery was designed for each service with both desktop and mobile functionality for an intuitive user experience. Visit the finished website at kauffmanmedispa.com.